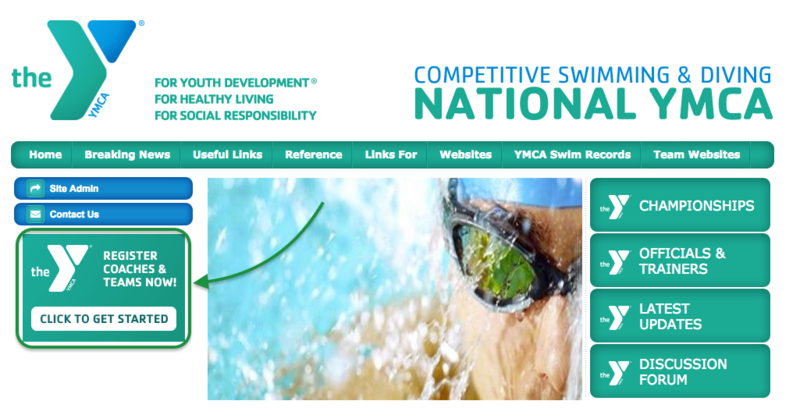 Welcome to the new YMCA Competitive Swimming and Diving Registration Portal powered by TeamUnify. If your team is using a TeamUnify website log into your account and you will now find the new system integrated into your site under the YMCA Admin section at the bottom of your side menu bar. To learn more about the system please skip to the lesson on Submitting Your Team Registration. If you do not know how to access your YMCA Registration Portal please continue with this tutorial. We will walk you through the process of getting started for both TeamUnify and non-TeamUnify Customers. 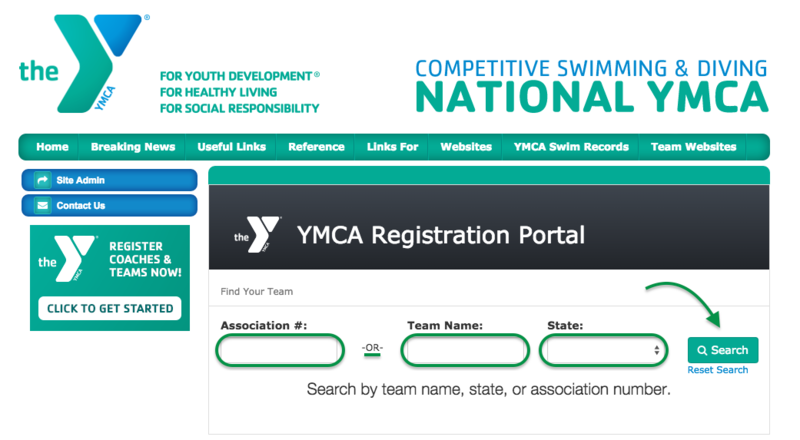 The new YMCA Registration Portal is used to submit coach registrations, team registrations, and meet sanction requests. 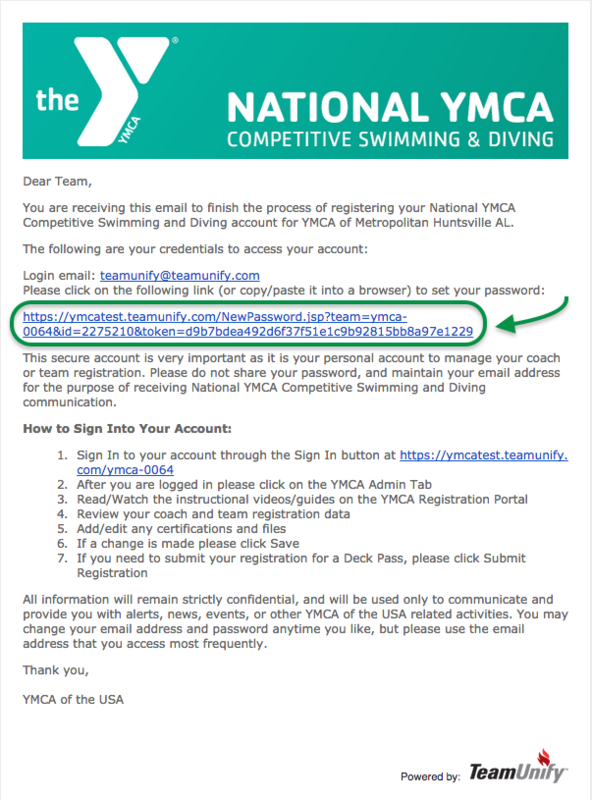 To find your YMCA, navigate to either the YMCA National site or your Regional site and click the Register Coaches & Teams Now button. From the YMCA Search page, you will be presented with a few ways to find your YMCA — by Association # or by Team Name and State. Click Search and you will be presented with a list of YMCAs to choose from. Find your YMCA and click Select or Reset Search if your YMCA does not appear. You will now be presented with some information about the registration process. 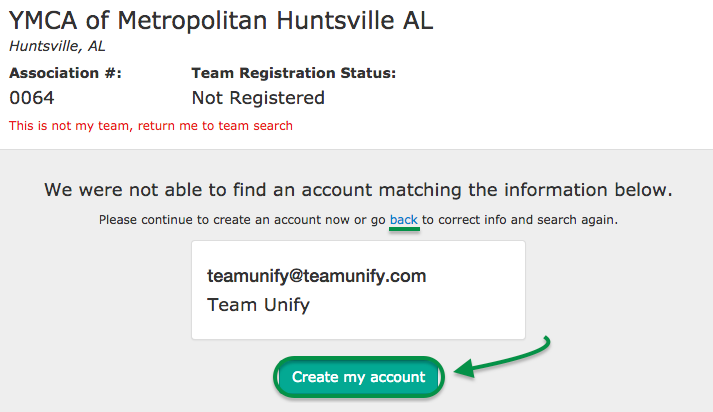 Please note, as a TeamUnify customer, your team administrator will need to create an account on your team’s website if you have never logged in before. Please email or contact your Team Administrator to create a login if you do not have one. Next, click the Continue to my team’s website button. You will now be presented with some information about the registration process. If you have a login to your team’s registration portal please click Yes I have a login button. If you have a login but forgot your password also click the Yes I have a login and use the reset password functionality. If you have never created an account or logged in to the new YMCA Registration portal please click the No I do not have a login button. If you have a login please skip to the Account Login step of this Lesson. If you do not have a login please continue to the next step. After logging in, you will be redirected to the YMCA Registration Portal homepage. From here you can choose to continue the process to register yourself or someone else as a coach, register your team, or to submit a meet sanction request. Enter your email address, first name and last name. Please enter the email address that you have used when registering in the past and click Continue; you can update it later if necessary. The YMCA Registration Portal will attempt to find your existing registration. If it finds that you have previously registered with the YMCA, you can simply click the Reset my password button. A password reset email will be sent to your email address with instructions on how to finish setting up your account. If you happen to remember your password you can click Wait, I remember my password and you will be redirected to your team’s portal. In the event that we are unable to find your existing registration, you will have the ability to create a new account by clicking Create my account. Please follow the instructions on the screen and enter the required information, then click Create Now. Once entered, further instructions will be sent to you via email to finish creating your account. It will take anywhere from 24-48 hours for you to receive this email. Once you have received this email please follow the instructions. You will find your instructions, your email login, a link to set your password and a link to your team’s homepage. It is a good idea to bookmark or save this web address for future use. Click the long URL link to set your password. Type in your password you want to set for your account, type it again and click Change Password. The two fields must match. Once on your website, login with the login email address and password you use to access your TeamUnify team website and click Sign In. If you do not remember your login, follow the reset password instructions. 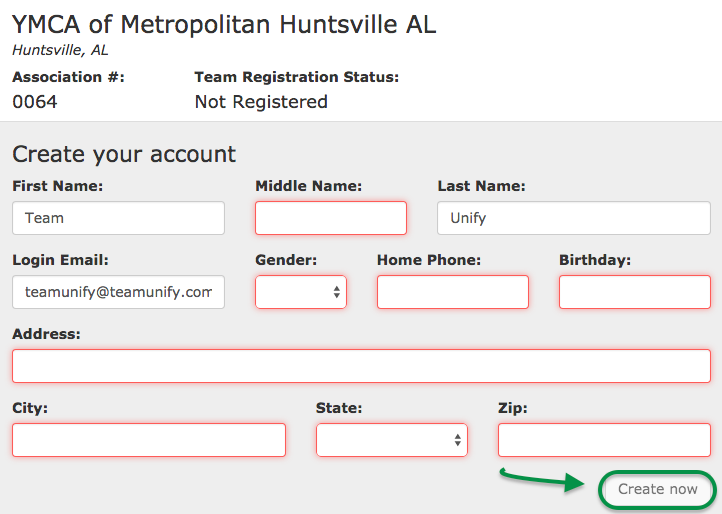 If you do not have a login or need help, please contact your team’s TeamUnify Website Administrator. 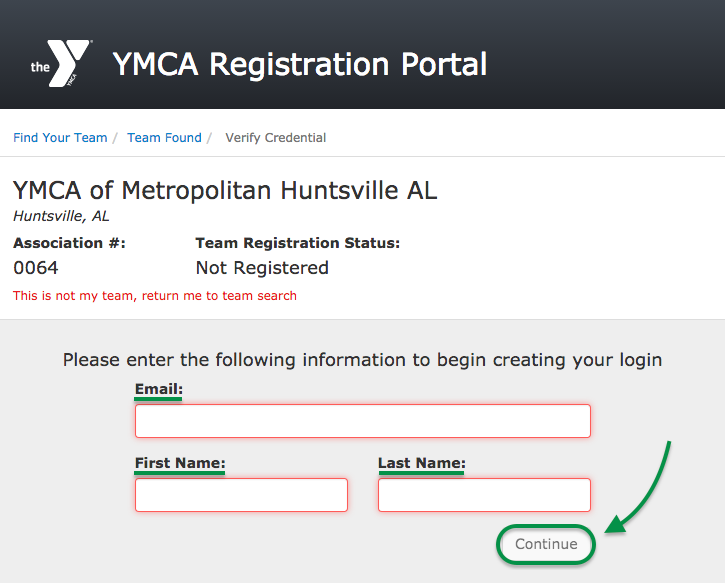 After logging in, you will be redirected to the YMCA Registration Portal homepage. From here you can choose to continue the process to register yourself or someone else as a coach, register your team, or submit a meet sanction request.